You. Me. Ride This Crazy Train - Adventures and Observations on The GO: Reading and stretching for the win! This is why I love the TTC subway. So much to see. Reading and stretching for the win! This is why I love the TTC subway. So much to see. 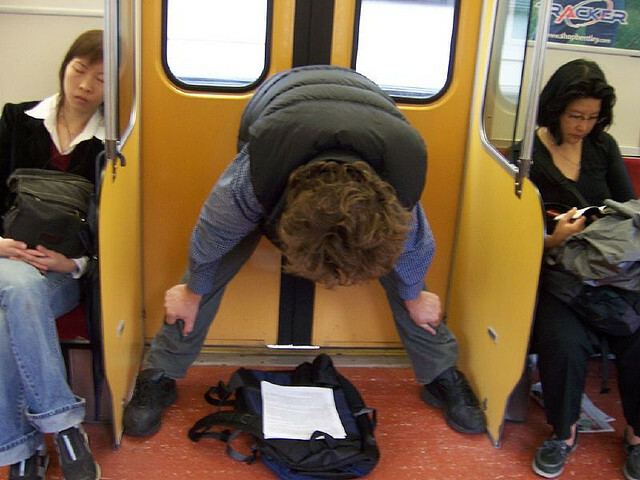 @TomW, but how funny would it be to the people on the train if he was leaning on them when they opened!! Those trains aren't even in service anymore. They retired the H-5 (yellow door) subway cars in June 3013. The person who sent the photo didn't know my site existed when he took the pic and acknowledged it was old. No worries. People take pics and keep them on their phone - it happens. Then suddenly... a place to use it! My husband & I were on a mid-afternoon train once -- not overly crowded -- and a lady got up & was doing yoga-type stretches in the aisle. On & off, all the way to Pickering.